Engineers have been studying back dynamics for over 30 years. This manufacturer of premium lumbar supports, offers its customers the optimum level of quality and versatility in an entire line of manual and power lumbar supports. With several different models, from manual adjustable to flexi-cable, to 2-way and 4-way electric and massage, each unit will give you an infinite range of adjustable possibilities for continuous, individualized comfort. These same lumbar supports have now become standard original equipment in some of the world's finest automobiles, including GM, Ford and Chrysler. In addition, many of the world's airlines have installed the same Lumbar Supports into the seating of first and business class seating sections. 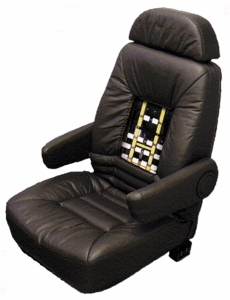 In fact, these same Lumbar Support are becoming standard original equipment in a myriad of home and office furniture, recreational vehicles and commercial transportation uses.